If you visit this site enough time, you probably wondering is I ever even cook savory stuff. Let me put that to rest. I do cook savory stuff, actually LOTS of savory dishes. Except that most is done at night, during the weekdays and after a long day at work. I tend to get home, drop everything in the dining room table and get to work on creating a fast dinner. And of course, every single time I forget to take pictures of what I’m doing. It’s more about feeding our empty bellies than documenting the process. We are hungry people! I know. And I hear you loud and clear. I have to get better with it and get in the grove of things and think like a good blogger and snap away during the meal preparation. I'm working on it. But this I have to share. Scala Quinn is the executive food director for Martha Stewart Living and is a co-host of PBS’s Everyday Food. Scala Quinn does not disappoint. I love the simplicity of the book itself. Full of great pictures and captions (“Never be caught without bacon” – How true is that?) along with great tidbits of information and her funny real life stories makes this book perfect for a home-cook. Especially since most of her recipes are ideal to make do with what you have on hand. The real-life example of this? Sunday night I open my freezer to see what I could unfreeze and use for Monday’s night dinner. The first thing I took out was a package of country style ribs. I did a quick search in my cookbook library and came across the “Luscious oven-braised short ribs” recipe in Mad Hungry. The recipe called for 12 ingredients, I had 11 of them. After 2 ½ hours in the oven, the ribs came out tender, juicy swimming on top of a reduced spicy glaze, perfect to top mash potatoes. The best thing about the recipe is that after about 20 minutes of prep time, you pop it in the oven and go about your business while your house starts to smell so good, that your neighbor may showed up at your door and ask what in the hell is cooking in your kitchen. Now run to get this done, you will not be disappointed and the men (and everyone else) in your life will love you forever and ever – AMEN! Mix all ingredients except the meat and potatoes in a 9x15-inch roasting pan (I actually did this in a bowl). Add the ribs and rub all over with the marinade. The meat should fit comfortably in a single layer in the pan. 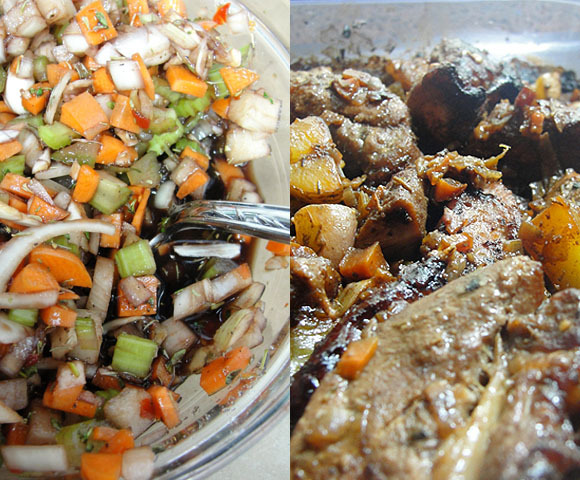 Cover and let marinate in the refrigerator for 6 hours or up to overnight. (I let mine overnight). Occasionally turn the meat over in the marinade. 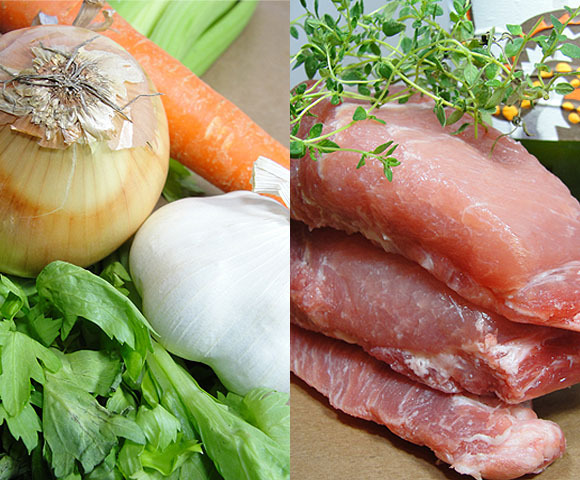 Remove from the refrigerator 30 minutes prior to cooking. Preheat the oven to 400 degrees. 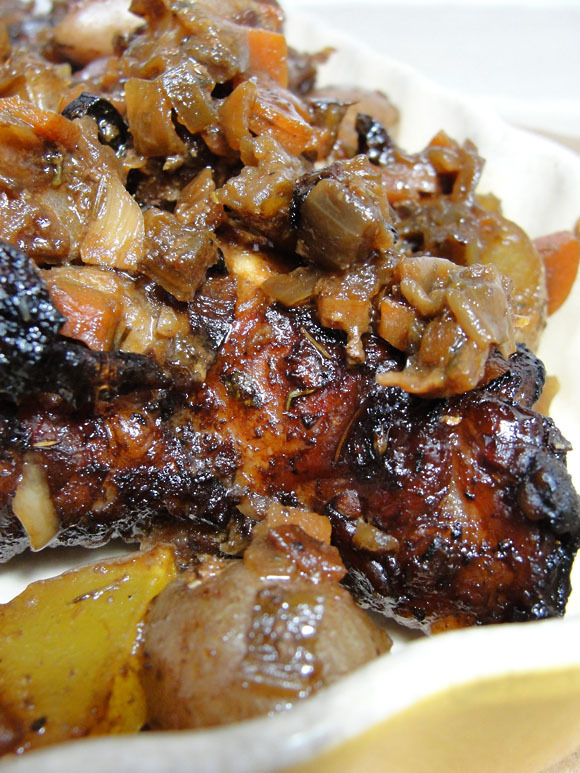 Braise the short ribs for 2 ½ to 3 hours, reducing the heat to 350 after an hour. Turn the ribs over. Add the potatoes in the last 40 minutes of cooking. Add water to the pan if too much liquid evaporates. You want to end up with glistening ribs in a reduce glaze. I did not use the leek, since that was my missing ingredients; and I’m pretty sure it did not take away from the final dish by not including it. I also did not use short ribs, but country style ribs, again it did not take away from it. But, they are currently some short ribs in my refrigerator for me to re-do. I choose to marinate my ribs in a bowl overnight and then place in the roasting pan to come to room temperature before placing in the oven. My liquid did evaporate a bit, but instead of adding water, I used red wine.